Shanghai, 27 December, 2017: Today, Swedish Blueair, a world leader in air purification solutions, launched the first Alibaba TMALL Super Brand Day for air purifiers in the Shanghai Super Brand Mall. The purpose of the joint TMALL-Blueair on- and offline event was to introduce “air purifiers” as the 4th "must-have" household appliance for the Chinese family. Washing machines, refrigerators and air conditioners are today standard in tens of millions of Chinese homes. With air quality being a rising concern by Chinese families, particularly those living in big cities, air purifiers for the home and on-the-go are becoming the next “must-have” household appliances. The message was underlined by the China Household Electrical Appliances Research Institute which also suggests that air purifiers have become an essential household appliance. “China is one of our most important markets, and Blueair is therefore proud to have been selected by TMALL as the air purification brand to lead the way to improve the health and well-being of Chinese families” said Maggie Chan, General Manager of Blueair China. Since entering China, some ten years ago, we have been working hard to provide Chinese consumers with state-of-the art air purification products for the home, the office and on-the-go. This recognition of the importance of the category, proves that we are on the right way” continued Chan. Yu Qiao, TMALL General Manager of Small Electronic Appliances congratulated Blueair as the first air purifier brand for Super Brand Day: “TMALL has worked with Blueair since 2014 and we are committed to continue working together to ensure that more people get access to clean air and to build this category as the fourth white electronic (after air conditioner, fridge, washing machine) for ideal home in China”. The air purification category has more than doubled in size over the past few years. Swedish Blueair entered the Chinese market in 2006 at what point, air purifiers were still relatively unknown. In 2010, when China started disclosing PM2.5 levels, Blueair being one of the first brands on the market, was the choice of health conscious consumers. 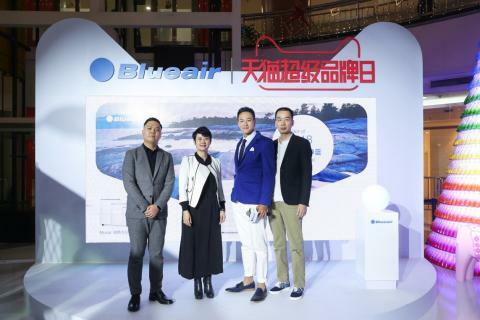 To coincide with the event at the prestigious Super Brand Mall in Shanghai, Blueair launched an "Air Color" campaign on the Moji APP providing the daily Air Quality Index (AQI) with intuitive colors to make it easier for people to check the air quality.